Living in Europe, specifically France, and traveling internationally, I’m used to the fact that other countries allow the police to stop you and verify your residency/visa/immigration status. While racial profiling can happen, it is not common, and document checking is much more tolerated in countries that have numerous neighbors just several hundred kilometers away. In the US, we just don’t have the same international mindset and have gotten quite used to living in a very large country with little interactions with foreigners. President Barack Obama has strongly criticized the law and numerous cities, like Los Angeles and San Francisco, have passed measures barring city agencies from signing/renewing contracts with Arizona-based companies. Ha ha! Crayola Rocks with The Fleshtones! 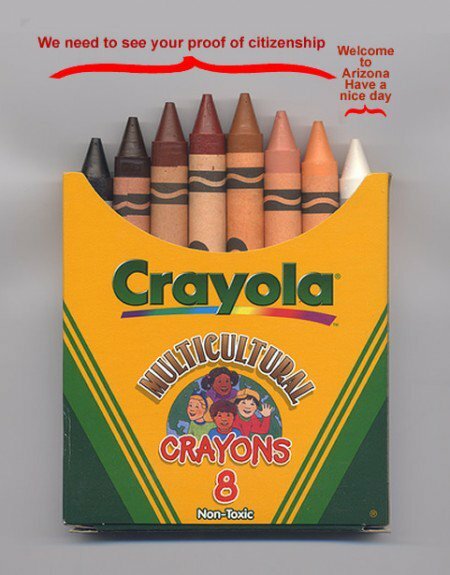 multi-cultural crayons are the best and should have been around a long time ago.